Gorgonzola dulce, ripe figs and fresh-off-the-tree cherries. Basically, all of my favourite things on a plate. I have been terribly absent of late. Very naughty. Very sorry. One of my (not particularly good) excuses for being absent is that I've recently whisked down to Brighton to watch one of the party conferences in action. Not especially food relevant, except to say that there's a wonderfully exciting vegetarian restaurant (I know, vegetarian = wrong) called Terre à Terre which has simply got to be tried, and a great little gelateria called Boho Gelato which has some very entertaining flavours. But enough of all that. This post is really about pasta. You'll see why in a sec. Apart from the papery vol-au-vents and greasy samosas that are handed round at receptions in lieu of canapés, there's not really much to recommend political conferences in terms of their food. But that doesn’t stop people talking about food. And in the middle of the conference I remembered a series of Tweets I'd seen over the summer from Ed Balls MP about BBQing. 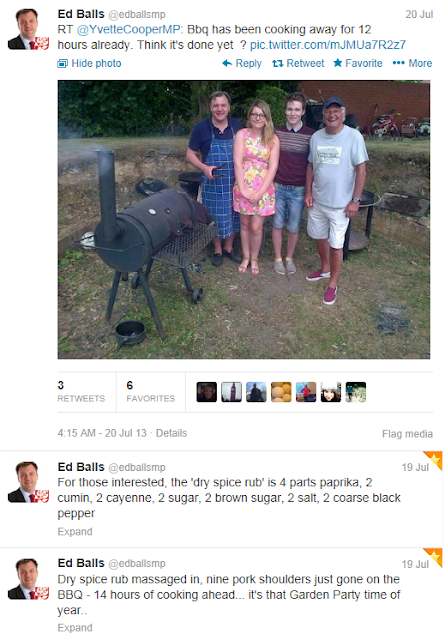 Now, whether you like Ed Balls or not is irrelevant, and I make no comment in that regard. It caught my eye for one reason and one reason only: How about a post on politicians' recipes? I scoured the internet, and before long something turned up. It was a face off of Gordon Brown and David Cameron donating recipes to a charity cookbook. Gordon's was unremarkable. What a surprise. David's was very remarkable. Mostly because I've seen it before. Mostly because it mirrors, basically, word-for-word the quick sausage pasta sauce recipe set out in Ruth Rogers' and Rose Grey's inimitable River Café cookbook. Thieving sod. I know this because it's one of my all-time favourite dishes and I've cooked this recipe so many times that I've got it basically by heart. So I'm going to share it with you too. Sort of. Because, having tried and re-tried this recipe from memory so many times, I imagine I'm a little off with the details. But this should work nevertheless. 1/3 bottle of vin rouge. Or vino rosso, I guess. 1. Chop your garlic into tiny wee pieces. Chop your onion small too. Cook off the onion for a bit, then add your garlic, so it doesn’t burn. Cook until soft and translucent, but not going brown. No crispy bits wanted here. As you can see, I'm using my favourite, massive Le Creusset. In most cases, you could get away with using a big frying pan or a skillet, but as I'm doubling the recipe I had to go for something bigger. Just imagine that it’s a big skillet if you're using the pictures for guidance. Or just double the quantities, because this is bloody marvellous stuff. …and end up looking a bit like meaty poos. 3. Get the pot nice and hot and add said sausages to the pot Cook the sausage meat right down, until any associated liquid has disappeared, breaking it up into smaller chunks as you go along. At first, it won’t want to break up, but it gets easier the more it's cooked. 4. When the liquid has gone, add the chili flakes. Another alternative could be using a whole chipotle (a type of Mexican smoked chili), but I didn't think about that 'til it was too late. Now keep cooking the meat until it’s browned and starting to crisp. This can take up to 15-20 minutes. 5. By now you're probably trying to find out where I live. Because I've given you a recipe and you've followed it religiously, and now you have an amazing amount of crap stuck to the bottom of your beautiful (and rather expensive) enamel pot that you're quite convinced will never come off. Well, fret not. Not it's time to add the wine and give it a scrape. See? All better now. Now turn the gas up to full and cook the wine off completely. 6. Once the wine's gone, add the tomatoes, bring to a simmer and reduce the heat to keep it there. 7. Get the pasta on. Cook to instructions. 8. Add the parmesan and nutmeg and stir stir stir until it's all melted in. This is why there's no real need to season until now; the nutmeg takes the pepper's place and the parmesan is salty enough. So now taste and test. Oh, and take the sauce off the heat. 9. When the pasta is ready, drain and return to its pan. Add a couple of dollops of sauce and a couple of tablespoons of crème fraiche per person. Mix it all up. Just a note: If you add all the crème fraiche to the sauce at this stage, you can’t really reheat it, as the fat in the cream will separate. If you're going to eat the whole thing in sitting, then go ahead and mix the sauce and the cream together – you'll actually find it easier to mix them without the pasta. But if not, I'd do it this way around. And there you have it. Throw more parmesan on if you like, but I don’t reckon you'll need it. Recently, GrubsterGirl and I have been celebrating some rather special news. Not that it's particularly relevant, but it is how we managed to find ourselves out for dinner the other night with some old friends. For weeks – literally, both friend and I are rather disorganised, could not get it together – restaurant recommendations and proposed dates went back and forth. Then suddenly I found myself remembering that there was a place I had been dead keen on going to for a while: Nikita's. Nikita's is a Russian-themed restaurant. I think. No, in fact, I'm sure. There are a lot of giveaways – the copious amounts of vodka on offer (I counted 32, which is more types of vodka than I actually thought existed), the Russian folk music, the caviar, or the Russian Orthodox Church themed bar. 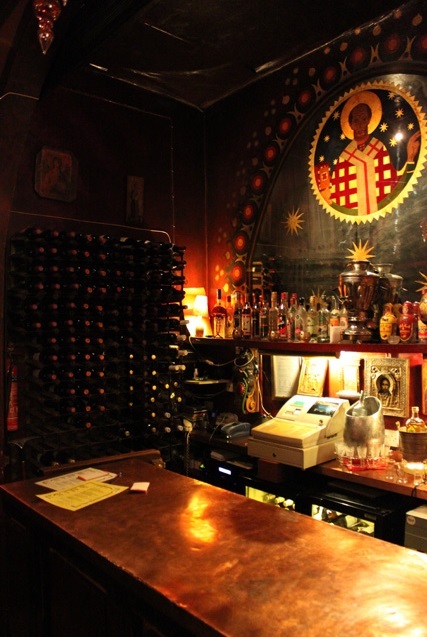 No, really, they have a Russian Orthodox Church themed bar. Much fussing and debating was had about drinks to start. Eventually it was held that vodka was a requirement (it would feel churlish to go and not have vodka) and a carafe of the Krepkaya was ordered up – not realising, of course, that we had requested a pretty lethal species of the spirit. It arrived, in all its glory, encased in a full-on block of ice, the restaurant's particular party trick. To accompany our food we also ordered up a bottle of Montenegrin 2007 Vranac. Yes, actually. But again, why wouldn’t you, in a Russian restaurant? Well, it turns out that there are a number of reasons, actually, but the best being that we could have achieved much the same effect if we'd just ordered a bottle of Ribena – in terms of colour and taste. It's not hard, I'm afraid, to guess from this wine why Montenegro hasn’t gone on to dominate the international wine market. For starters, I had pirozhki (пирожки) – little pastry pillows, some stuffed with sausage meat and others stuffed with spinach and cream. Nice enough, if rather bland. GrubsterGirl ordered herself pelmeni (пельмень), which is described on the menu as "traditional dough parcels filled with fresh herbs and minced meat, served with sour cream and buillon soup". In fact, I was on the cusp of ordering the same for myself, until I had vivid flashbacks to a 2001 trip to Moscow during which, at the equivalent of a cream tea, I bit into an attractive looking donut that turned out to be filled with watery, stewed cabbage. Trust me, that sort of thing puts one off experimenting with any Russian foods described as "traditional dough parcels filled with…"
What arrived was far from a cabbage donut, and appeared (as you can see) more like tortellini. Still, again nice but bland. For mains, GG attempted the govjazhij farsh s komponentami. Try saying that clearly after a couple of slugs of overproof vodka and Montenegrin wine. Don’t worry, she didn’t try to: it's basically steak tartare, which is how she ordered it. Not the most Russian of dishes, I hear you cry? No, but it was Anna Pavlova's favourite – not, in fact, the eponymous pudding. Establishing a general theme of the food, the tartare was nice enough without being anything special. And, as the picture shows, it was served with Hovis – no speciality bread or carefully sourced loaf here. I felt slightly disappointed – an attempt to source some Russian black bread or sculpt a blini might have been a nice tough. But, then again, perhaps there's something rather (stereotypically) Russian about that – all the luxury (steak, caviar, vodka) in a rough and ready style, without the finishing touches. What's more, my own main, I'm pleased to say, departed from the norm to which I was becoming accustomed. I recalled visiting Novosibirsk (capital of Siberia, no less) a few years back for a conference, during which time my fellow delegates and I were whisked around town in a motorcade, taken to expensive restaurants, fed and watered almost endlessly, and generally fussed over. At one meal, about three quarters of the way through the week, I tried to refuse food. VERY BAD FORM, it turned out, and so I tried to order the lightest thing on the menu: a pancake filled with chicken livers with a cream sauce. (It speaks volumes, I think, about the style of food we were eating that that was the lightest option). The result was pure heaven, and still one of the best dishes I have ever eaten. So when I saw something vaguely approaching that on the menu – described as "best fillet steak, wrapped in a light pancake, served with a mushroom, onion, and red pepper vodka sauce" (I just love that it's described as "best fillet steak'" Say it in a Russian accent and you'll get what I mean.) I simply could not resist. And it was fantastic. Soft, tender fillet, doused in a rich, mushroomy sauce topped with its pancake. You'd think the pancake wouldn't work, or might be an unnecessary addition. You’d be wrong; it adds a certain je ne sais quoi that shouldn’t be missed. Govjazhij stejk v souse (meaning, I think, fillet steak and sauce, which is a pretty accurate description as these things go) it had to be. Pudding, however, was a reversion to form, or even a slip. For me it was apple strudel, really as plain as plain can be. GG's pudding was that famous pavlova. Now, I'm not actually a kitchen tyrant that demands making everything from scratch – in fact, I have a great pavlova ice cream recipe that frankly insists on pre-made meringues. But, seriously, in a restaurant such blatant piling of Asda's finest is cutting it a little high. All round, I liked Nikita's it's kind of hard not to – it's not about the food, which is pretty average, to be honest, it's about the atmosphere. It's about the fun, the booze, the down-at-heel luxury, the Russian staff who can’t understand a word you say, the faded majesty, the over-the-top setting, and the crazy, drunken accordionist, Roman Yuchenko who's the spitting image of Teddy Heath and who serenades you throughout dinner. Would I change anything? Yes, one thing: I'd go with a huge gang of friends. More vodka, more noise, singalong accordion-ing, the works. Tucked away in a residential backstreet in Brompton, on a street that a young Tony Blair used to live, no less, is a proper gem. But it's more a party gem than a dinner for two gem. Look, I know I'm coming to this party a little bit late, but really: Burger & Lobster is awesome. The menu (or lack thereof) is pretty well known by now. There are three choices: whole lobster, whole lobster in a roll, or a burger. Each one costs a flat £20. Which leads me to ask the question that I was sorely tempted to ask the scoffers next to us: why oh why oh why would you pay twenty quid for a burger? And, really, why would you not order a twenty quid lobster? Because that is a bargain. I was forced to conclude that they don’t really like food that much. GrubsterGirl was sensible an ordered up the grilled lobster. Essentially, all of their lobsters are steamed in massive industrial steamers. You can either have it straight away (broiled) or you can send it off to be blackened, which is where the beast is lobbed onto a big charcoal grill for a bit of singeing before it's cracked and dumped on your plate, together with a mound of fries and salad. I went for the lobster roll. Yum yum yum. In fairness, there's nothing wrong with the lobster roll option and, despite my describing the lobster-in-a-shell option as GG being "sensible", I wouldn’t call the lobster roll "un-sensible". After all, that's a whole lobster-worth of meat in that roll. Which is kinda the downside. Because you want to know that you're eating a proper big lobster, not have it hammered home to you that the great crustacean holds less meat than a quarter pounder patty. What's more, you're going to end up a bit bored if you play it like we did; I finished my meal about twenty minutes before GG did. You see, a whole lobster takes a while to eat – there's all the mucking about with crackers and claw picks – whereas basically you could push a whole lobster roll into your mouth in one. Which is pretty much what you're going to want to do. Because this is some good lobster. This is a bun filled with solid, rich, sweet, salty lobster meat, doused in sauce, and served up piping hot. And it don’t get much better than that. Especially this far from the sea. Some years back I lived in Edinburgh, the Athens of the North, a fine epithet as epithets go, although you never hear people referring to Athens as the Edinburgh of the South. 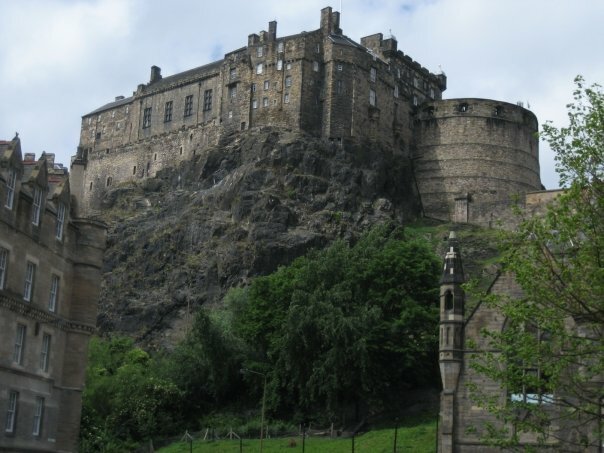 There was, in the 'burgh, a pretty decent farmers market on Castle Terrace, sitting in the shadow of the Castle. Not a bad place to be. Once, I stumbled upon hot smoked salmon being sold in bloody great big chunks. 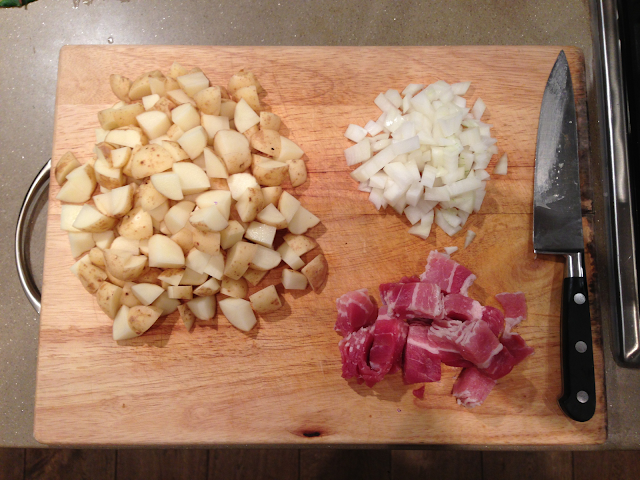 I succumbed, and bought it, cooking it up that night with potatoes, smoky bacon, onions and tomatoes. It was aces. I hadn’t seen smoked salmon being sold in big chunks like that for some time. Until last night, in Sainsburys. Even then it wasn't being sold hot smoked, but lightly oak smoked. Nevertheless, I had to try to recreate the magic. Adapting (slightly) a Nigel slater recipe I set about my task. 1. Chop them onions finely. Chop the bacon. Nigel says postage stamp sized, which is a great unit of size that I am going to adopt generally. Chop the tatties small. I couldn’t be faffed to do Nigel's 'tiny chips', which was a big mistake – these took too long to cook, meaning the bacon was a touch overdone by the end. 2. Get the onions and bacon frying in the pan, softening the onions and browning the bacon ever-so-slightly. It's going to get a lot more cooking, so don't crisp it up at this stage. Do add a little oil – sure, the bacon will produce some, but you'll need extra for the tatties. Once there, add said tatties and start frying, turning them every so often. 3. Put the fish in a saucepan with the cream, bay leaves and peppercorns. Six peppercorns. Not five, not seven; six. Also, bay leaves. Courtesy of a neighbour's garden. Oops. Simmer for five minutes or so, then lid on, heat off, and leave to soak up the ambience whilst the tatties finish off. 4. Wash your greens. Really. I know it says you need to on the packet, and that you never do, but seriously: do it. Mine had a flipping huge caterpillar in a cocoon in it that started crawling out to attack me when it was disturbed. Remove the thick inner stalk (see below) and slice into thick ribbons. Steam for one minute when the tatties are about done. Add no butter or flavouring; the sauce will do all the magic. 5. Assemble. Tatties & bacon on plate, fish fillet on top, sauce over everything and greens on the side. Wolf down.